The University Scholars Program will sponsor four Alternative Spring Break service and learning trips in 2018, all developed and led by Scholars in consultation with the Faculty Fellows and our colleagues in the Center of Community Service. These Alternative Spring Breaks are opportunities for University Scholars to engage meaningfully with partner organizations and communities that are working to address pressing issues. To learn more about the impact and experience of a Scholars Alternative Spring Break, check out the descriptions and videos documenting last year's trips. Then, apply via the Center of Community Service's online system! Sustainable Fair-Trade Coffee Farming: R.A.W. Tours (San Marcos de Tarrazu, Costa Rica) – Partnering with R.A.W. Tours, your time in San Marcos will give you a first-hand look at the inner workings of the fair trade coffee initiatives in Costa Rica. 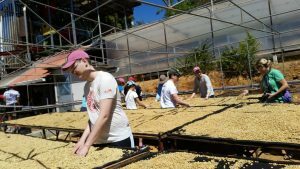 Volunteers will get immersed in the coffee culture, visiting several local coffee farms and experiencing all aspects of the growing, harvesting, and milling process. You will work side by side with local workers in all phases of the coffee manufacturing process – out in the fields, taste testing, on the treatment and harvesting lines, and finally, quality control, distribution and marketing. Participants will also complete a service project in cooperation with local residents. Protecting Our Oceans: Citizen Science & Advocacy for Marine Mammals: Earthwatch (Golfo Dulce, Costa Rica) - One of the most helpful ways to conserve wildlife in coastal environments is to create a Marine Protected Area (MPA), which limits the type and amount of human activity permitted within its waters. For about a decade, scientists have been gathering data in an effort to create an MPA in one of the most biodiverse areas on the planet, at the southernmost peninsula of Golfo Dulce, Costa Rica. Partnering with Earthwatch, we will work as citizen-scientists assisting in documenting the needs, behaviors, and environment of the cetaceans that inhabit these waters: bottlenose dolphins, pantropical spotted dolphins, and humpback whales. We will contribute to the body of data needed to create an MPA, learn about marine conservation in a global context, study fascinating marine life, and explore what it means to be an advocate for the oceans. Childhood Education and Healthcare: Global Volunteers (Lima, Peru) - According to UNICEF, 25% of Peruvian children under the age of 5 are chronically malnourished, 59% of children ages 5-11 are below their grade level in math and communication skills, and almost 60% of children under the age of 11 are considered poor. This poverty inhibits children from receiving the proper education, health services, and general care they need to develop both mentally and physically. By working with Global Volunteers and their partners Puericultorio Pérez Araníbar (PPA) and Municipality of Miraflores in Peru, we will contribute to efforts to improve language and socialization skills, educate on proper hygiene and nutrition habits, and repair/rebuild valuable facilities. 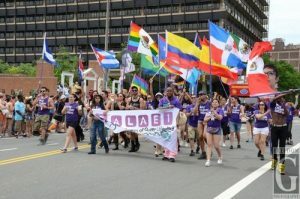 Health and Social Justice for Queer Latinx Communities: Galaei (Philadelphia, Pennsylvania) - While the annual HIV infection rate has dropped by 10% from 2010 to 2014 overall, it has increased by 14% for Hispanic/Latino gay and bisexual men. Discussions about queerness are often whitewashed, and portrayals of the LGBTQ+ community are overwhelmingly white in the media. Galaei is a queer Latin@ social justice organization. Its work includes a youth program that provides leadership development, an HIV prevention program, a Trans Equity program, and cultural literacy trainings. By working with Galaei, volunteers will gain insight into the struggle of coming to terms with intersectional identities, the challenges that queer Latin@ populations face, and the grassroots work of community empowerment. All Scholars are encouraged to apply. The deadline is October 30, 2017.